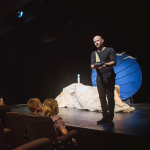 The program enables you to choose a workshop type that suits your students and classroom needs, and allows the possibility of lengthier artist-in-residence programs. Workshop tutors are all professional performers or designers and have been trained to present workshops that will have children brainstorming, creating, making and performing. 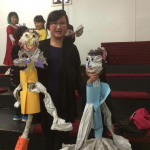 School of Puppetry workshops are a potent vehicle for arts education, meeting design and technology outcomes and they can be tailored to meet the needs of both primary and secondary students. We can bring our workshops to you or you can come to us! All workshops run for 1.5 hours and can accommodate up to 30 students, unless otherwise stated. Residencies are available on request. Utilising recycled materials along with wire, glue, drills, saws, hammers and loads of imagination, children create fantastical creature puppets from junk. Combining problem solving skills, technology and construction principals of puppetry design. Suitable for children aged 9 and above. Our most popular workshop, creative and perfectly suited for young children aged 4 and above. Children will be creating their own puppet characters using a range of soft fabric materials and the difficulty level of the workshop can be adapted for different age ranges. 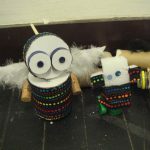 A simple puppet making experience that encourages children to explore how everyday materials like paper can be transformed into living, breathing puppets. Manipulation and story telling form a greater component of this workshop encouraging literacy and critical and creative thinking. Acting, story creation, puppet manipulation and play. 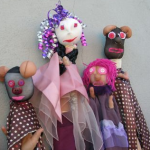 This workshop introduces children to performance skills through improvisation and storytelling and is a great addition to a puppet making workshop or enjoy using our professionally made collection of puppets. A Puppetry Presentation for large groups, with interactive demonstrations and intriguing insights into the wonderful world of puppets and puppetry techniques. Marionettes, Bunraku, hand, rod body puppets and many more will be brought to life for your group. 40+ students, Running Time: 1hr. This workshop invites students to discover the myriad of technical elements that are involved in a production and how they can be controlled to influence mood and emotion. 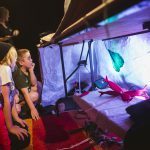 Lead by a professional technician, participants are encouraged to put what they’ve learned into practice within Spare Parts fully functional Theatre in Fremantle. To get the most out of this workshop, we recommend booking a series or a full day for your class. Workshop will be tailored to suit your timetable. 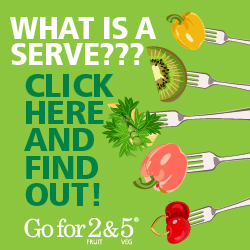 Suitable for year 6 and above.